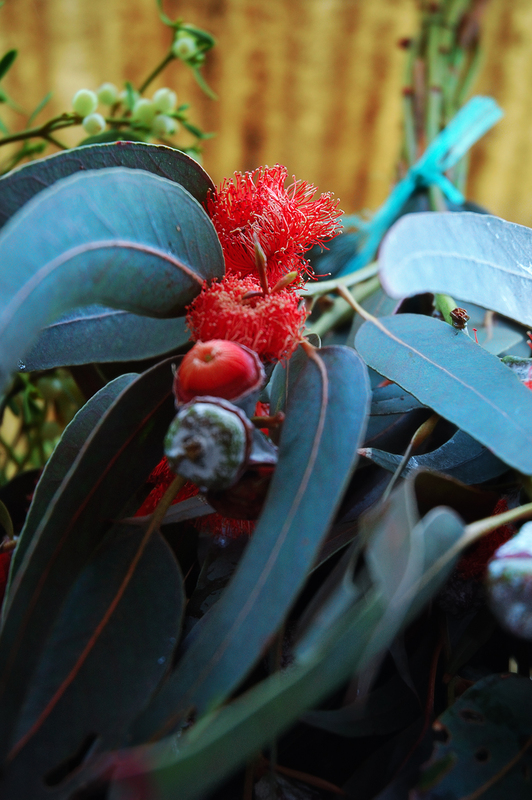 This is just a detail of an Eucalyptus wreath I caught during a recent visit to Santa Llucia Christmas market. Yes, I know, my posting is way behind schedule. I guess I will never be up-to-date. Taking pictures is so time consuming that I can't shoot and post daily and manage to keep some minimum quality. Well, I digress. As I said the market or Fira de Santa Llucia is already set and it is of course a must see in Barcelona. It is located in front of Barcelona Cathedral and I strongly recommend you visit it at night. That is beautiful! And you have given me an idea. I feel so guilty that I didn't plant the eucalyptus that I bought over the summer. It's still in the plastic pot and I'm afraid it will not make it through the winter. But I will cut pieces of it to make a wreath for the back door (our neighbor always sends a wreath for our front door). I think I will also just plant the poor thing and hope for the best! i believe those of us who have obligations to the rest of the world understand the times when one can't sit down at the computer to post! Hey...just chanced upon your blog. Very interesting.... your blog is an ecellent resource on Barcelona. But more than the content on Barcelona, the blog is treasure trove on photography and photography skills. I will be back for more. -Lydia, I don't know if it will grow again but surely it will make a good wreath. They are very resistant trees I think. I don't know much anyway. -Me neither. Well, if I saw them before I wasn't aware. It has been an interesting discovery for me. Thanks for the support Deborah. -Be my guest Wizard. Thanks. -Oh Westy, thanks. It was a pleasant surprise today :) I will read about blue gum trees. Thanks for pointing this out. Santa Llúcia!!. Esa fira me encanta, intento no perdérmela, es pura tradición. Felicidades por el Weekly Pick en VFXY!! -Tim that's very kind of you. -Muchísimas gracias Marta. Una feria muy bonita si señor. A ver si nos vemos por ahí. Las fotografias son muy bonitas. La mayoría de estos eucaliptos son teñidos con una sustancia igual que las rosas y los claveles azules. No sé si le explicaré bien a tu comentarista lo que sigue.